Stine Aaen Dürr Har lavet dette oplæg til nogle kursister…. Jeg mener godt at det kan bruges i folkeskolen eller der er i hver fald nogle idéer der kan bruges. Kursisterne organiseres i grupper, som får en række spørgsmål til teksten. Gruppen skal besvare spørgsmålene i Google Docs, hvor alle i gruppen kan se og redigere i det samme dokument. I kan se et eksempel fra “den virkelige verden” her. Det giver en god dimension i arbejdet, at alle i gruppen kan se det skrevne. De svage kan måske se, hvor grundigt de dygtige besvarer opgaver. Man kan I opsamlingen få de enkelte gruppers besvarelser op på smartboard. Kursisterne kan lave en analyse og fortolkning af en tekst, hvorefter de laver en præsentation på en digital væg. 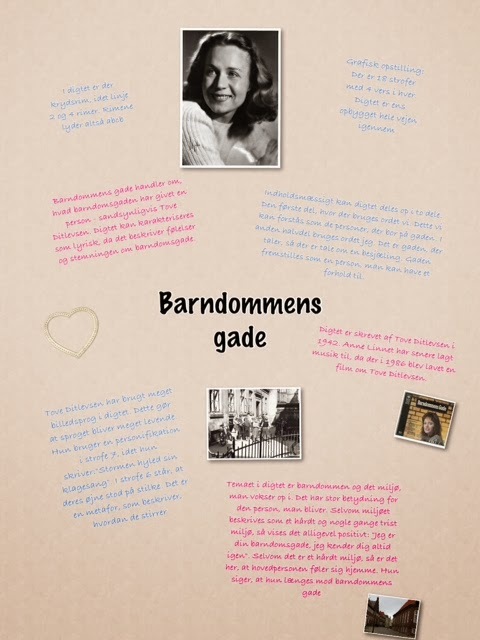 Her kan I se et eksempel lavet i Piccollage. De kreative kursister elsker denne øvelse, og det er fantastisk at printe sådanne vægge ud og hænge op i klassen. Klassen deles i to. Den ene halvdel arbejder med en tekst, mens den anden halvdel arbejder med en anden tekst. Jeg plejer altid at lave denne øvelse, når vi arbejder med H.C. Andersen og Natasja (de fleste kender nok teksterne). Når kursisterne er færdige, fremlægger de deres analyse og fortolkning for hinanden to og to. De skriver forskelle og ligheder på de to tekster ind i et Venn-diagram, som I kan se her. Klassen organiseres i 4-6 grupper, som alle fårforskellige fokuspunkter til teksten. Når grupperne har arbejdet med deres fokuspunkter, sætter man en fra alle grupperne sammen. Her fremlægger de for hinanden (matrixarbejde). Det er en rigtig god øvelse, da alle tvinges til at være aktive. De skal jo fremlægge for nogle andre! Når alle har fået fremlagt deres fokuspunkter, har alle en nogenlunde samlet analyse og fortolkning af teksten. De kan vise, at de har lyttet efter i gruppearbejdet ved at besvare en Google Formular som denne. Kursisterne laver en analyse og fortolkning to og to. Hvert makkerpar får ansvaret for at fremlægge en opgave og indsætte den på en væg i Padlet. Når vi samler op, har alle makkerpar således en opgave, som de står for. Det giver en god dimension, at vi har noget på skrift (altså på væggen i Padlet), som vi kan sætte op på smartboard. I kan her se et eksempel fra en time, hvor vi arbejdede med filmtekniske virkemidler. Have you ever considered about adding a little bit more than just your articles? I mean, what you say is fundamental and all. But think of if you added some great images or videos to give your posts more, “pop”! Your content is excellent but with pics and video clips, this blog could definitely be one of the most beneficial in its niche. Wonderful blog! I am often to running a blog and i actually appreciate your content. The article has actually peaks my interest. I’m going to bookmark your web site and hold checking for brand spanking new information. Thank you, I have just been looking for information about this subject for ages and yours is the best I have discovered so far. But, what about the conclusion? Are you sure about the source? You made some respectable points there. I seemed on the internet for the difficulty and found most people will go together with together with your website. Nice read, I just passed this onto a colleague who was doing a little research on that. And he just bought me lunch because I found it for him smile Thus let me rephrase that: Thanks for lunch! “We have two ears and one mouth so that we can listen twice as much as we speak.” by Epictetus. Hi there! I know this is kinda off topic nevertheless I’d figured I’d ask. Would you be interested in exchanging links or maybe guest writing a blog post or vice-versa? My website addresses a lot of the same subjects as yours and I believe we could greatly benefit from each other. If you are interested feel free to shoot me an email. I look forward to hearing from you! Superb blog by the way! Generally I don’t read article on blogs, however I would like to say that this write-up very pressured me to take a look at and do it! Your writing taste has been amazed me. Thanks, quite nice post. I do like the manner in which you have framed this particular difficulty and it really does provide us some fodder for consideration. On the other hand, through just what I have witnessed, I just simply wish when other feed-back pile on that individuals remain on point and don’t get started upon a soap box associated with the news du jour. Anyway, thank you for this outstanding piece and whilst I do not necessarily go along with this in totality, I respect your standpoint. I have been checking out some of your stories and i must say pretty nice stuff. I will surely bookmark your blog. Thanks for sharing superb informations. Your web site is so cool. I’m impressed by the details that you’ve on this web site. It reveals how nicely you perceive this subject. Bookmarked this website page, will come back for extra articles. You, my friend, ROCK! I found simply the information I already searched all over the place and simply couldn’t come across. What an ideal web-site. I do consider all the concepts you have offered for your post. They are very convincing and can definitely work. Still, the posts are too brief for newbies. May just you please extend them a bit from subsequent time? Thank you for the post. I’ve recently started a site, the information you provide on this web site has helped me tremendously. Thank you for all of your time & work. “‘Tis our true policy to steer clear of permanent alliances with any portion of the foreign world.” by George Washington. Just desire to say your article is as amazing. The clearness in your post is just cool and i could assume you are an expert on this subject. Well with your permission allow me to grab your RSS feed to keep updated with forthcoming post. Thanks a million and please carry on the enjoyable work. Thanks for any other informative blog. Where else may just I am getting that kind of info written in such a perfect approach? I’ve a challenge that I am simply now operating on, and I have been on the look out for such information. I’d have to test with you here. Which is not one thing I usually do! I enjoy studying a post that will make people think. Also, thanks for allowing me to comment! Simply wish to say your article is as amazing. The clearness in your post is simply great and i could assume you are an expert on this subject. Well with your permission allow me to grab your RSS feed to keep up to date with forthcoming post. Thanks a million and please carry on the enjoyable work. I’ve been exploring for a little for any high-quality articles or blog posts on this sort of area . Exploring in Yahoo I at last stumbled upon this site. Reading this info So i’m happy to convey that I’ve a very good uncanny feeling I discovered exactly what I needed. I most certainly will make sure to do not forget this website and give it a look regularly. Merely wanna comment on few general things, The website design and style is perfect, the content is rattling excellent : D.
I’m usually to running a blog and i actually recognize your content. The article has really peaks my interest. I’m going to bookmark your site and maintain checking for brand spanking new information. I’m still learning from you, but I’m making my way to the top as well. I certainly liked reading everything that is posted on your website.Keep the information coming. I enjoyed it! Fantastic website. Plenty of useful information here. I¦m sending it to a few friends ans additionally sharing in delicious. And certainly, thank you to your effort! Well I sincerely liked reading it. This information provided by you is very practical for proper planning. That is very interesting, You’re a very skilled blogger. I have joined your rss feed and look ahead to seeking extra of your excellent post. Additionally, I’ve shared your web site in my social networks! Heya i am for the first time here. I came across this board and I in finding It really helpful & it helped me out a lot. I’m hoping to give something back and help others like you helped me. Great ?V I should definitely pronounce, impressed with your website. I had no trouble navigating through all the tabs as well as related information ended up being truly easy to do to access. I recently found what I hoped for before you know it at all. Quite unusual. Is likely to appreciate it for those who add forums or something, site theme . a tones way for your client to communicate. Excellent task..
Whats up! I just want to give an enormous thumbs up for the good info you could have here on this post. I shall be coming back to your weblog for extra soon. It’s actually a nice and useful piece of information. I’m satisfied that you just shared this useful info with us. Please stay us informed like this. Thank you for sharing. hello!,I love your writing very so much! share we be in contact extra about your article on AOL? I require a specialist in this house to solve my problem. May be that is you! Taking a look ahead to peer you. Just want to say your article is as surprising. The clearness for your publish is just great and i could assume you’re a professional on this subject. Fine with your permission allow me to grasp your RSS feed to stay up to date with forthcoming post. Thanks one million and please continue the gratifying work. Rattling excellent information can be found on website. I envy your work, thanks for all the great articles. Great post, you have pointed out some fantastic details , I likewise conceive this s a very superb website. Have you ever considered publishing an ebook or guest authoring on other blogs? I have a blog centered on the same information you discuss and would love to have you share some stories/information. I know my audience would value your work. If you’re even remotely interested, feel free to shoot me an e-mail. Thanks for the good writeup. It in fact was a amusement account it. Glance complicated to far brought agreeable from you! However, how could we be in contact? Thanks a lot for sharing this with all people you actually recognize what you’re speaking approximately! Bookmarked. Kindly also seek advice from my website =). We can have a link change contract among us! fantastic issues altogether, you simply gained a new reader. What may you suggest about your post that you simply made some days in the past? Any positive? Thank you for sharing superb informations. Your website is so cool. I’m impressed by the details that you have on this website. It reveals how nicely you perceive this subject. Bookmarked this website page, will come back for more articles. You, my friend, ROCK! I found simply the info I already searched all over the place and simply couldn’t come across. What a great website. Do you have a spam problem on this blog; I also am a blogger, and I was wanting to know your situation; many of us have created some nice procedures and we are looking to swap methods with other folks, please shoot me an e-mail if interested. Great post, you have pointed out some excellent details , I likewise think this s a very fantastic website. Some genuinely fantastic information, Gladiola I discovered this. Thank you for another magnificent post. Where else could anybody get that type of information in such a perfect way of writing? I have a presentation next week, and I am on the search for such info. I just like the valuable information you provide to your articles. I will bookmark your weblog and take a look at again here frequently. I am slightly certain I’ll learn many new stuff proper here! Good luck for the next! I do love the manner in which you have framed this challenge plus it really does supply me personally some fodder for thought. On the other hand, through what I have experienced, I only hope as the actual comments pile on that men and women remain on issue and not get started upon a soap box involving some other news du jour. All the same, thank you for this excellent piece and although I can not necessarily agree with this in totality, I value your point of view. I’ve been exploring for a little bit for any high quality articles or blog posts on this sort of area . Exploring in Yahoo I at last stumbled upon this web site. Reading this info So i’m happy to convey that I’ve a very good uncanny feeling I discovered just what I needed. I most certainly will make certain to do not forget this web site and give it a look on a constant basis. Right now it looks like Expression Engine is the preferred blogging platform out there right now. (from what I’ve read) Is that what you’re using on your blog? Howdy would you mind letting me know which webhost you’re working with? I’ve loaded your blog in 3 different internet browsers and I must say this blog loads a lot quicker then most. Can you suggest a good hosting provider at a fair price? Kudos, I appreciate it! I?¦ve learn a few just right stuff here. Certainly value bookmarking for revisiting. I surprise how so much effort you put to make the sort of great informative website. What i do not understood is actually how you are now not really a lot more neatly-appreciated than you might be now. You’re so intelligent. You already know therefore considerably in terms of this matter, produced me for my part believe it from a lot of various angles. Its like men and women aren’t fascinated except it is something to do with Lady gaga! Your own stuffs great. All the time take care of it up! Have you ever thought about creating an ebook or guest authoring on other blogs? I have a blog based upon on the same information you discuss and would really like to have you share some stories/information. I know my readers would enjoy your work. If you are even remotely interested, feel free to send me an e-mail. Hello there, just became alert to your weblog thru Google, and located that it is truly informative. I’m going to be careful for brussels. I’ll be grateful when you continue this in future. Lots of folks shall be benefited from your writing. Cheers! I do consider all the ideas you’ve presented for your post. They’re really convincing and will definitely work. Still, the posts are very short for novices. May just you please prolong them a bit from subsequent time? Thanks for the post. Howdy I am so thrilled I found your site, I really found you by mistake, while I was researching on Google for something else, Regardless I am here now and would just like to say thank you for a tremendous post and a all round entertaining blog (I also love the theme/design), I don’t have time to look over it all at the moment but I have saved it and also added in your RSS feeds, so when I have time I will be back to read a great deal more, Please do keep up the superb job. Hello, Neat post. There’s an issue with your web site in internet explorer, could test this?K IE nonetheless is the market leader and a big component to folks will leave out your magnificent writing due to this problem. I would like to thank you for the efforts you have put in writing this web site. I’m hoping the same high-grade website post from you in the upcoming also. Actually your creative writing abilities has inspired me to get my own web site now. Actually the blogging is spreading its wings rapidly. Your write up is a good example of it. I’ve been browsing on-line greater than three hours as of late, yet I by no means found any attention-grabbing article like yours. It is beautiful value sufficient for me. In my view, if all website owners and bloggers made excellent content material as you probably did, the web will be much more useful than ever before. “It’s all right to have butterflies in your stomach. Just get them to fly in formation.” by Dr. Rob Gilbert. But wanna input on few general things, The website pattern is perfect, the subject matter is rattling wonderful. “The idea of God is the sole wrong for which I cannot forgive mankind.” by Marquis de Sade. Keep up the good piece of work, I read few content on this web site and I believe that your blog is real interesting and has circles of wonderful information. Merely wanna remark on few general things, The website design is perfect, the subject matter is very good. “To imagine is everything, to know is nothing at all.” by Anatole France. It’s appropriate time to make a few plans for the long run and it is time to be happy. I’ve read this post and if I could I desire to recommend you few attention-grabbing issues or advice. Perhaps you can write subsequent articles relating to this article. I want to learn more things approximately it! I am happy that I found this site, just the right info that I was searching for! . You made a few good points there. I did a search on the theme and found the majority of folks will go along with with your blog. I’m still learning from you, but I’m trying to reach my goals. I definitely enjoy reading everything that is written on your site.Keep the posts coming. I enjoyed it! Sweet site, super design and style, really clean and utilize genial. I’ve been exploring for a bit for any high-quality articles or blog posts on this kind of area . Exploring in Yahoo I at last stumbled upon this web site. Reading this info So i’m happy to convey that I have a very good uncanny feeling I discovered exactly what I needed. I most certainly will make sure to don’t forget this website and give it a glance regularly. You are my inhalation, I possess few blogs and often run out from post :). “Follow your inclinations with due regard to the policeman round the corner.” by W. Somerset Maugham. Thanks a bunch for sharing this with all folks you actually recognize what you are talking about! Bookmarked. Kindly also seek advice from my web site =). We will have a link change contract among us! Very interesting points you have mentioned, appreciate it for putting up. “Death is Nature’s expert advice to get plenty of Life.” by Johann Wolfgang von Goethe. I have been checking out some of your stories and i can state nice stuff. I will surely bookmark your website. Hi there would you mind letting me know which webhost you’re working with? I’ve loaded your blog in 3 completely different internet browsers and I must say this blog loads a lot faster then most. Can you suggest a good web hosting provider at a reasonable price? Thank you, I appreciate it! Hello, you used to write great, but the last several posts have been kinda boring?K I miss your tremendous writings. Past several posts are just a bit out of track! come on! Hello! I’ve been following your web site for a while now and finally got the bravery to go ahead and give you a shout out from Huffman Tx! Just wanted to tell you keep up the fantastic work! I really glad to find this web site on bing, just what I was looking for : D as well saved to my bookmarks. Its superb as your other blog posts : D, regards for posting. It?¦s actually a nice and useful piece of information. I?¦m glad that you simply shared this helpful info with us. Please keep us up to date like this. Thank you for sharing. Thanks for another informative blog. Where else could I get that kind of info written in such an ideal way? I have a project that I am just now working on, and I have been on the look out for such info. But a smiling visitor here to share the love (:, btw great layout. “The price one pays for pursuing a profession, or calling, is an intimate knowledge of its ugly side.” by James Arthur Baldwin. I am not rattling excellent with English but I find this rattling easygoing to understand. You actually make it seem so easy together with your presentation but I to find this topic to be actually one thing that I think I’d by no means understand. It kind of feels too complex and very extensive for me. I’m taking a look forward in your subsequent submit, I will try to get the dangle of it! Really fantastic information can be found on web blog. “I know of no great men except those who have rendered great service to the human race.” by Francois Marie Arouet Voltaire. Some genuinely wonderful info , Gladiola I observed this. You are my intake, I possess few web logs and sometimes run out from to post : (. Enjoyed studying this, very good stuff, thanks. “All things are difficult before they are easy.” by John Norley. Attractive component to content. I simply stumbled upon your blog and in accession capital to claim that I get in fact loved account your blog posts. Any way I will be subscribing in your feeds and even I fulfillment you get admission to consistently fast. Everyone loves what you guys tend to be up too. This sort of clever work and reporting! Keep up the amazing works guys I’ve included you guys to our blogroll. Thanks for some other informative blog. The place else may I get that type of information written in such a perfect approach? I’ve a project that I am just now operating on, and I have been at the look out for such info.